CyberPowerPC introduces the Zeus Hercules, a new Haswell based gaming laptop that's only available with Intel Iris Pro graphics 5200 integrated graphics. Pricing starts at $1,039. CyberPower Inc. www.cyberpowerpc.com, a global manufacturer of custom gaming PCs, gaming laptops, and performance workstations unveiled its Zeus Hercules gaming notebook, which represents a new class of performance and portability for gaming notebooks. 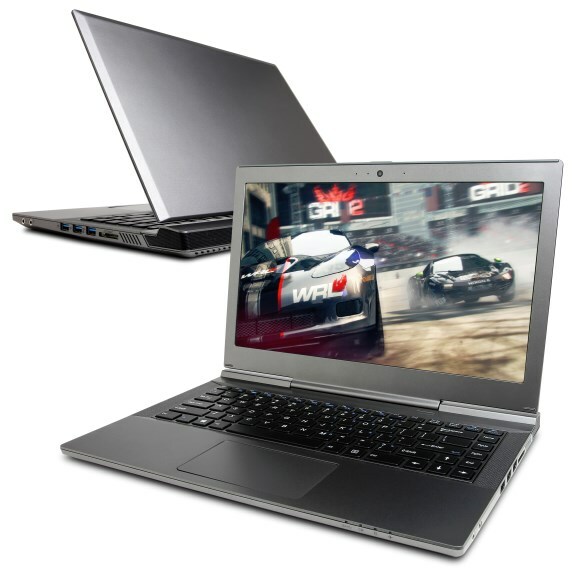 The Zeus Hercules incorporates some of the latest innovations from Intel, such as the hyperbaric cooling solution and Intel’s Iris Pro graphics 5200 that set a new standard for ultraportable gaming notebooks. The Zeus Hercules is as mighty as its name with it 4th Gen Intel Core i7-4750HQ processor that can be automatically overclocked to 3.2GHz via Intel Turbo Boost 2.0 technology. The Intel Iris Pro graphics 5200 is integrated onto this CPU giving you the processing and graphics power to slay any gaming application and smash through any graphics-intensive program that mortals can throw at you. With Intel Iris Pro graphics 5200, users can expect up to a 2X 3D performance improvement over today’s fastest mobile Intel HD Graphics solutions. Intel Iris graphics brings next-generation mobile computing devices to life with a built-in, eye-popping visual experience with no extra graphics card required. Other advancements found in the Zeus Hercules are the Intel Hyperbaric cooling technology, a highly efficient thermal solution that will revolutionize notebook PC cooling. The Intel Hyperbaric cooling architecture is able to efficiently cool the Intel Core i7-4750HQ processor, even under high load, and does it with near silence. With all the Intel pedigree, the Zeus Hercules is one of the most powerful slim gaming notebooks on the market. Weighing slightly over four pounds and measuring 13.38 inches wide, 9.96 inches deep and just 13/16 of an inch thick, the Hercules is 12 percent lighter and 18 percent thinner than competing slim gaming notebooks. The Hercules is built for mobility with its size, efficient CPU, and long lasting lithium ion battery giving users up to six hours of continuous use. To complement its muscle-bound hardware, the Zeus Hercules features a full HD 1080p 14-inch display; High definition audio; 8GB memory (expandable up to 16GB); 750GB 7200 RPM HDD with higher capacity HDD or performance drives such as mSATA and 2.5” SSD options available. Other standard features included with the Zeus Hercules include Intel Gigabit Ethernet LAN; 802.11n wireless with Bluetooth 4.0; 6-in-1 card reader and 1.0M HD camera. Three USB SuperSpeed 3.0 ports are included for connecting additional peripherals. The Zeus Hercules also features two digital video outs with a HDMI and mini DisplayPort. CYBERPOWERPC keeps everything running silent and cool with Intel’s Hyperbaric Cooling Technology and best in class acoustics. The system is pre-loaded with Microsoft Windows 8 Pro (64 Bit Edition).